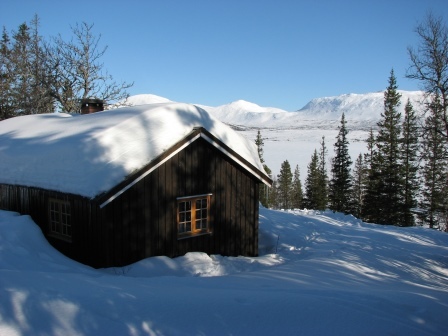 The Blåfjella – Skjækerfjella area is perfect for a cabin trip and hiking in the mountains. 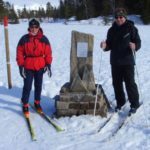 Park you car by Lustadvatnet in Ogndalen, 40 km from Steinkjer city centre, and follow marked winter trail to Norways geographical midpoint. There are some hills at the beginning of the trail, but the terrain will soon even out and you will be able to hike with more ease in the mountains. The trail up to the midpoint is winter marked, but from there winter markings stops. Skjækerhytta is about 1 km from the midpoint. The hike from the parking area to the cabin is 9 km and takes about 2 hours. 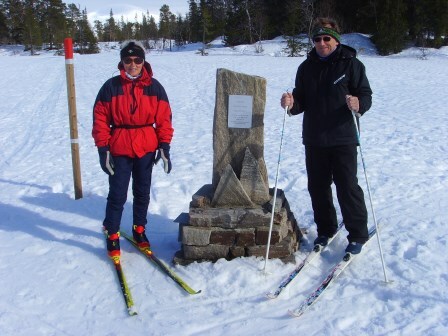 Take the detour to Norways geographic midtpoint! Skjækerhytta belongs to Snåsa Fjellstyre and is located by the north west end of Skjækervatnet (lake) with the Skjæker massif to the south east. 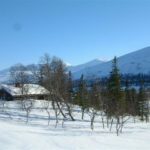 From the cabin, there is a great view over Skjækervatnet and towards Snåsa’s highest mountain top; Skjækerhatten – 1139 m.a.s.l. After a good nights sleep, the trip continues to Skjækerosstu, situated in the south end of Skjækervatnet. You can choose to hike to the left side of Skjækervatnet or combine this trip with a summit trip and hike to the east side of the lake. It is a great day hike from Skjækerhytta and Skjækerosstu up to both both Skjækerhatten and Løysmundhatten. Steinkjer kommuneskoger – Ogndalsbruket KF hire out Skjækerosstu, with Blåfjella – Skjækerfjella National Park as the closest neighbour. 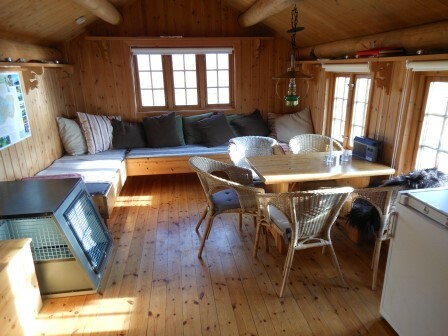 The cabin is located at the outlet of Skjækervatnet, with a greast view towards the lake, Skjækerhatten and the National Park. 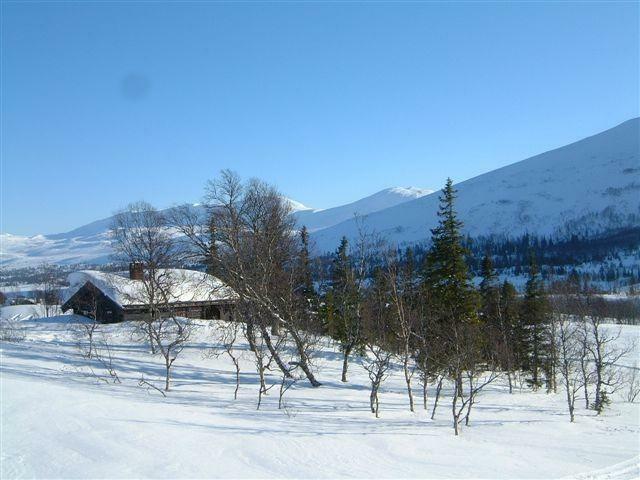 Quiet, gentle hills surround the cabin to the north, west and east and somewhat steeper challenges to the south. In short, hiking terrain to suit most people. 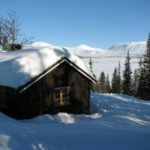 You can also choose Lågvassbu, situated just by Lågvatnet between Skjækerosstu and Mokk farm, an hours walk from Skjækerosstu and Skjækerhytta. When returning home, you can choose to either walk to the parking by Lustadvatnet or walk down to Mokk farm, 11 km. The terrain here is gentle and great for hiking, the last part down to Mokk Farm have some hills. You could enjoy a hearty dinner and an extra nights accommodation. Mokk farm offer transportation back to the car. Rate includes: Rental of the cabins for 2 nights. The cabins have fully equipped kitchens. There are pillows and duvets for the number of beds in Skjækerosstu and Lågvassbu. Bring your own duvet covers/sleeping bags. There are mattresses and pillows in Skjækerhytta, bring your own sleeping bags. Fishing in the lakes is free of charge. There are ice drills in Skjækerosstua and Lågvassbu. Tour Suggestion: From Gulburet to Øyna: Historic Trail with Wondrous Flavours! 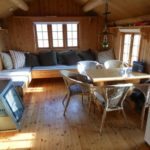 Do you appreciate a vibrant cultural landscapes, beautiful scenery, old wooden houses, historic surroundings, art and local food cooked with love? Blåfjella - Skjækerfjella / Låarte-Skæhkere National Park is one of Mid Norway's largest continuous areas of wilderness areas.